Saree with Jacket - Bollywood Divas’ Latest Saree Trend! The versatility of a saree is yet again proved on point with the latest fancy trend of saree with a jacket. This trend is literally the coolest, chicest and needs minimal fashion techniques. You don’t need to be a fashionista or a pro to pull off this trend effortlessly. Styling saree with jacket might seem tricky; it isn’t difficult if you know how to work the trend in your favor. And as always, our fashionistas and celebrities come to our rescue to show us how exactly they flaunted this trend in perfection! 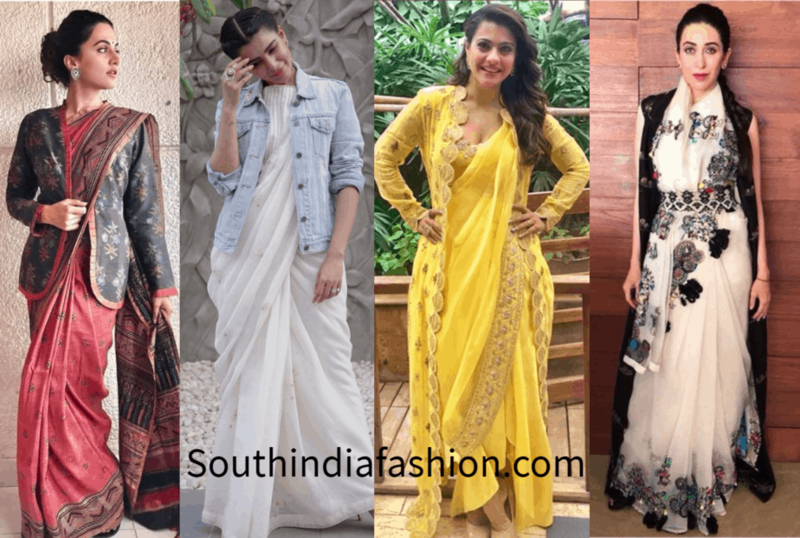 From Sonam pulling off this trend at the Cannes to Shilpa Reddy sporting silk saree with an embroidered jacket – this trend is worth a try! 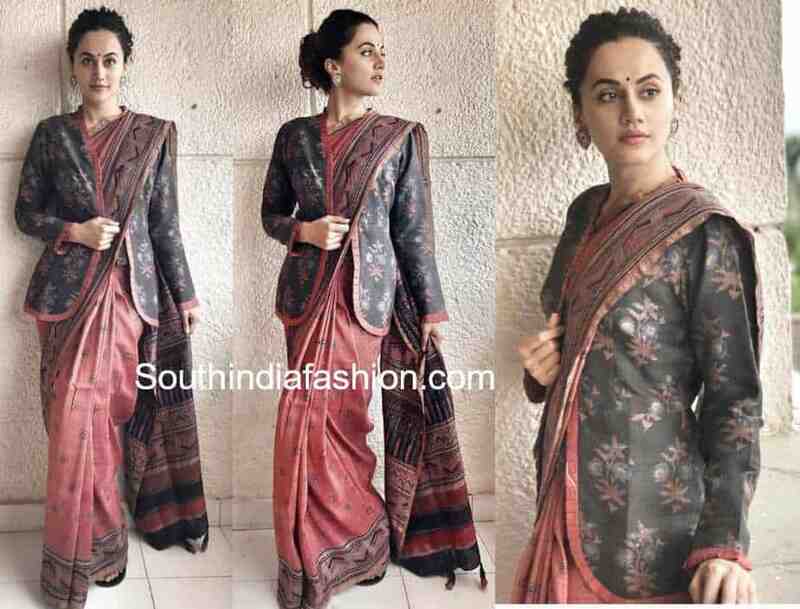 Taapsee wore this gorgeous saree with a jacket for her movie Mulk’s promotion. She gave some major office wear goals for the millennial working woman. 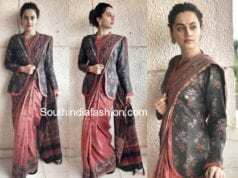 Wearing this gorgeous Anjali Jani hand block printed saree and dhupion jacket, Taapsee gave a refreshing twist to her usual look! That gorgeous shade of blue, ruffles and tassels – how can anyone go wrong with it? 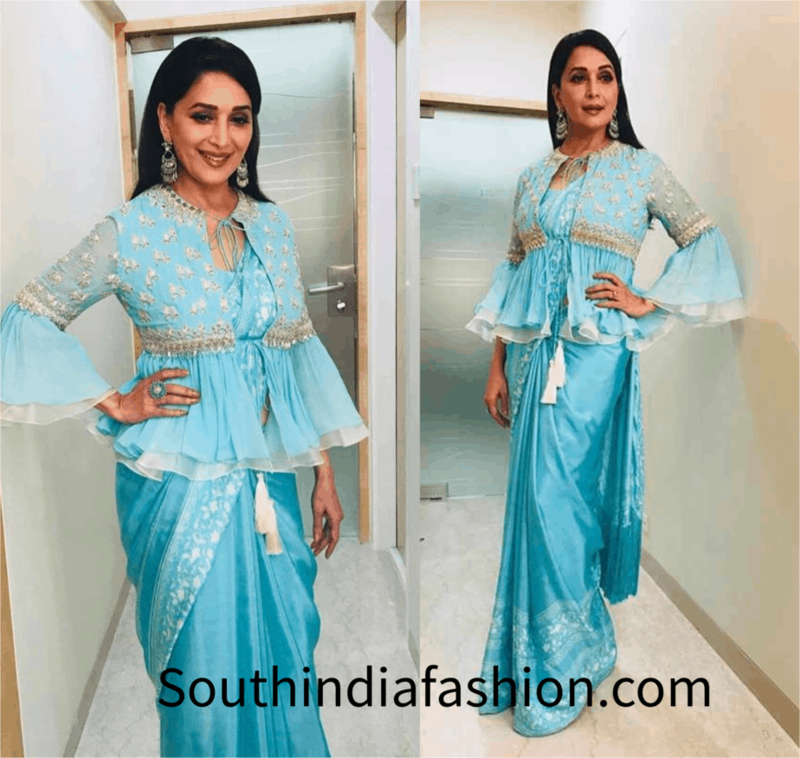 Madhuri Dixit pulled off this amazing trend like a pro and shattered all the fashion myths. This trend has nothing to do with age or style – you definitely can carry it off if you are confident and bold enough. This look has a subtle feminine and playful vibe thanks to the ruffles and tassels on the jacket. 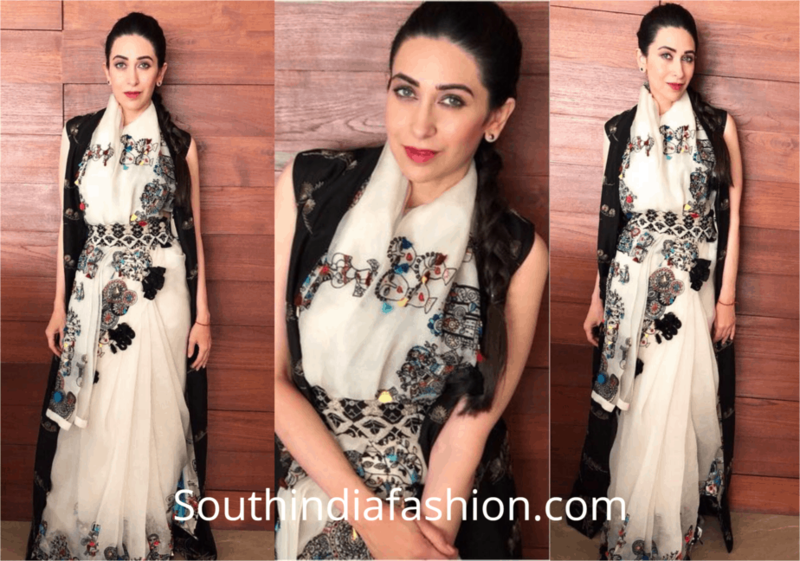 The way Karisma Kapoor wore the saree with jacket trend broke the glass ceiling in style! Ditching the concept of a short jacket, Karisma Kapoor put on a long jacket and styled her saree with jacket look in the chicest and contemporary way. Ditch keeping a regular pallu, wrap it around your neck like a scarf. Put on a sleeveless long jacket over it and you are ready to dazzle! Who would’ve known that someday you could wear your casual denim jacket with a saree?! Samantha showed us how to slay in this ensemble for an easy-breezy look. Denim is perfect for summer and you can simply pair your favorite linen or cotton saree and make everyone drool in awe! 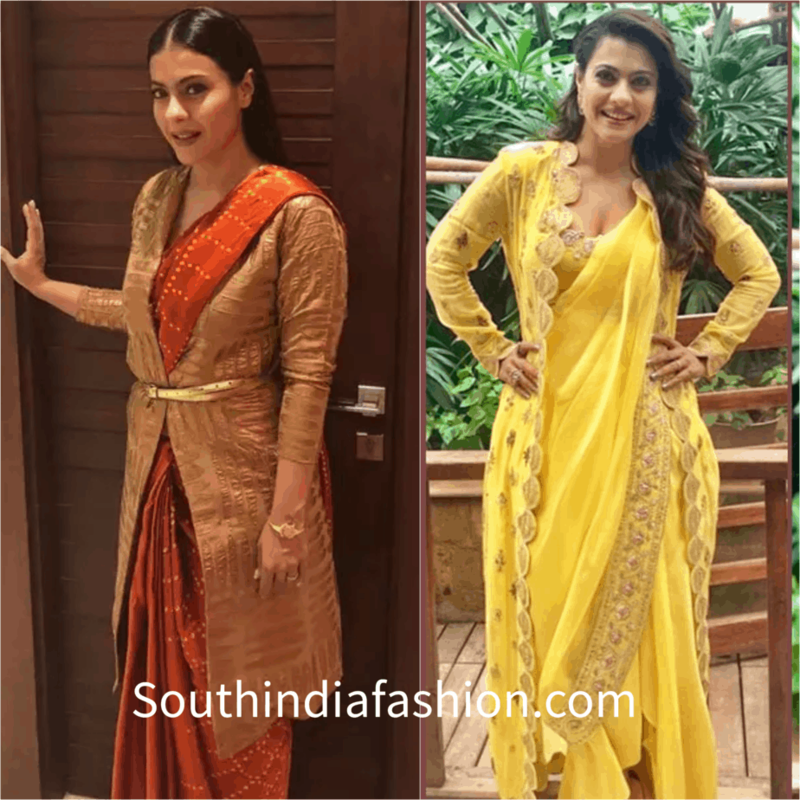 Kajol wore a stylish trend two times! She paired her rich silk saree with a long textured jacket and a cute thin belt. And the other time she chose a fancy bright yellow long jacket with cut edges that complimented her saree. Keeping the jewellery minimum, fixes focus on the outfit. Kareena Kapoor came up with a playful style to experiment with this trend. Mixing a gorgeous crepe saree with a formal vintage jacket, Kareena’s look calls for a round of applause. Ditching her blouse, this choice of a jacket was bold and looked upon by many! We’re totally crushing over the heavy statement neck-piece by Amrapali she paired to finish her look. Ditch your usual blouse and style your saree with a jacket and stay fashion forward! Let us know your thoughts about the trend in the comments below!